As you probably now by now, I am a predominately color shooter. I prefer it, I relate to it, and to be honest, sometimes I have a really hard time “seeing” in black and white when I am shooting. That being said, I am completely drawn to black and white photography!! It’s kind of an oddity for me to wrap my head around actually lol! My challenge to myself was to buy some new black and white film (I have a ton of expired rolls but I wanted a fresh look so I could really assess how it was supposed to look), AND, try out a film I had not tried before! Enter, Cinestill BXX. This film is interesting as I have shot the color Cinestill (and LOVED it - see the blog post “Art, photography and below zero temps” for images shot with the color) as it is made from a cinematic motion picture film, that has been modified for us to shoot it as still images! The look it offers is SO unique on the color version, and really beautiful on the b/w version! When I opened my email to reveal the scans, I was blown away. Keep in mind I have been shooting VERY expired black and white WHEN I actually decide to load it up, and they came out very faded, super huge grain, and just not quite what I had hoped for (my own fault for expecting something probably not possible from film that has been in the fridge since before 2005 lol). THIS film, seems to shoot SUPER contrasty, blacks are very “inky” and the highlights are sometimes lost, but I didn’t mind in the least! I scrolled the scans from the lab in awe because this, is the look I love! 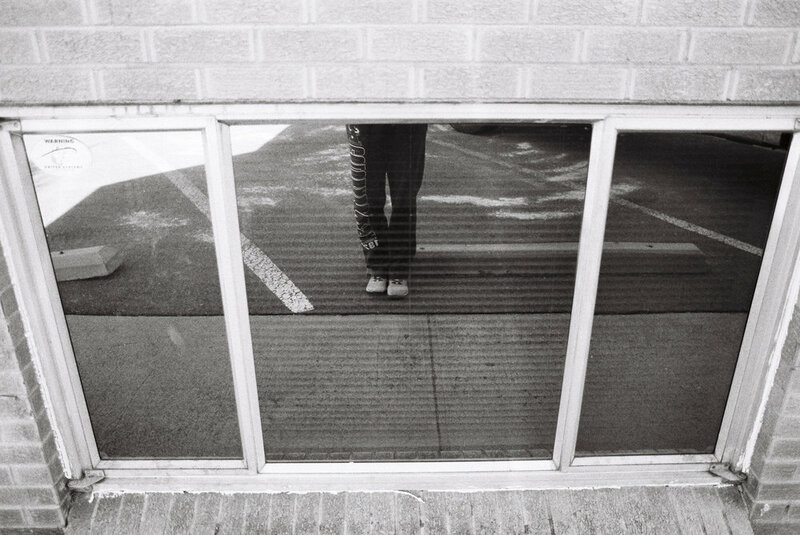 I decided to put this roll in the camera and somewhat force myself to shoot the 36 images, and learn to see with a different eye. I ran the roll out purposefully fast once Chris and I went to the Botanic Gardens because this color loving girl was dying to capture the fantastic colors inside the walls of the gardens! The great thing is, when I saw these, I was glad I was forced to “run the roll out” driving down to the gardens and then just inside! Below are a collection of some images shot on the drive in! My favorite of my quick shooting to finish up the roll! Once we were inside the gardens, I grabbed a few shots, and surprisingly, I liked them lol!! Back tracking a little bit, after I had loaded the film I was finishing up my wandering around in Golden a few weeks ago. I felt disappointed because I passed a house, a house I see all the time that is BRIGHT yellow, and has beautiful yellow sunflowers blooming in front of it in the summer, and all I had was b/w in the camera. I decided to go for the shot anyway. Results below. After hesitating to even take this shot, I ended up loving the look! This was DEFINITELY worth my while and I will absolutely be purchasing more of this film! It’s good for me to make myself retrain my eye, and while it was really kind of tough in the moment, it was well worth it in the end! Thank you for reading along!! I hope you are able to take something away from this post, if even just seeing some black and white images that you hopefully liked! I always enjoy connecting so if you have a favorite back and white film or digital conversion, I would love to hear about it!